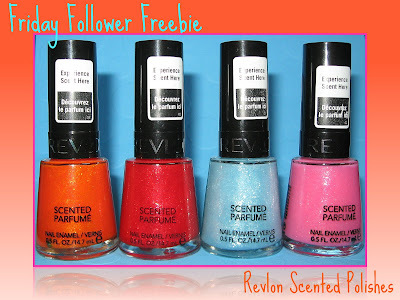 Today's Friday Follower Freebie features four of Revlon's newest scented polishes! 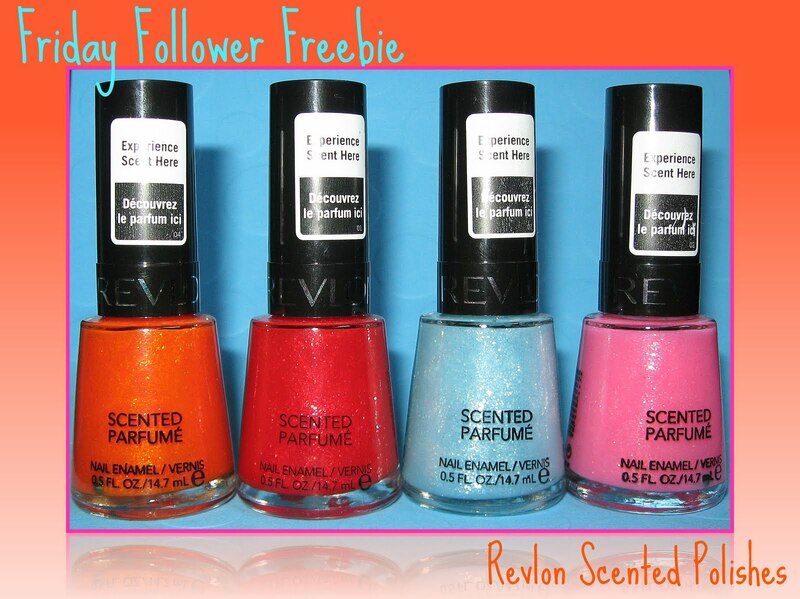 One follower will win all four shades...Orange Fizz, Watermelon Fizz, Colada Fizz, and Grapefruit Fizz! If you'd like to enter for a chance to win these polishes, just leave your eMail in the comments section below. I'll accept entries until I post my Come Monday weekly newsletter on July 18, at which time the winner will be announced. Good luck, and have a fabulous weekend! I love the shimmer in these. mmm sounds like booze ;) thank you for the contest! Thanks so much. I bet these will be hard to find in my area. These look so fun! Thanks! Never tried Revlon polishes but I'd love to ! I've been wanting to try the scented polishes! Thanks for the giveaway! Thanks again for such a nice giveaway :)! haven't seen these in canada yet! thanks for the giveaway! lydiane(dot)gaborieau(at)gmail.com Those nail polishes look awesome! jennafroggy@live.com btw I follow as Ferfer using my twitter account. I love their scented polishes! I'm really curious about the Grapefruit one. I tried Grape Fizz the other day and liked it :) Thanks for the giveaway! Thanks again for all your giveaways. That blue one looks so pretty! Wow. Thank you for this great giveaway, I've been meaning to try those nail polish out. I'd love to try all those colors, especially the blue one! another great giveaway :) thanks! Great contest. I just bought apple-tini fizz from this collection and almost bought, but passed up on the orange one. Hi! Thanks for this giveaway! Oh, I would love those! thanks for the giveaway and have a lovely weekend! I think I wrote a comment yesterday but I can't see it. Thanks for yet another giveaway! They don't even have these at my CVS or Wags yet! I wish I would have seen these before I bought 3/4 of them! Best of Luck to everyone entered! You'll love them!